Bringing proximity marketing as a solution to clients as a proximity marketing reseller can be quite a daunting task. This step-by-step guide will help you cover all the bases, understand what you should focus on and how to manage client expectations. Explain what proximity marketing is and the future of proximity marketing. Demonstrate why it is better to integrate proximity marketing as a strategy along with other traditional marketing tactics. Pacify their questions about beacon technology by presenting them with use-cases that are being used all around the world. If your client is interested in an app-less solution, explain how QR codes and NFC tags work. Most Android and iPhones natively support both these technologies and do not require an additional solution. Now that you have laid down the groundwork, explain the Beaconstac platform briefly and how the end-to-end solution works seamlessly. A short demo to show how and when the platform is used to create a markdown card or an interactive form will further solidify your stance. If you are pitching to a client on iOS or Android, make sure to have the NearBee app downloaded on their iPhone and explain its features to them. Setting up a campaign requires a lot of forethought and a hack-it together marketing strategy is not recommended. A small business vs. a medium or large business will require different marketing tactics. The vertical that your client’s business belongs to must be fully studied prior to a meeting. Sit down and understand the challenges that the business is currently facing. Understand the possible use-cases that may be applicable for the business and map solutions with BLE beacons. Ensure that the dwell time is at least or more than 5 minutes where the beacon is to be deployed. Since it can sometimes take a couple of minutes for a notification to appear on a smartphone – a location where customers are always flitting past is not ideal. Examples of high dwell-time areas include – lobbies, cafes, airport gates, and queues. Consider the footfall in the location you intend to deploy the beacon. What kind of beacon should be used? 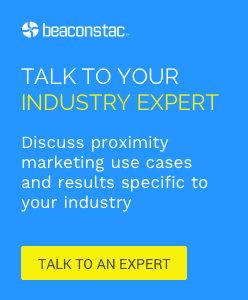 Beaconstac has 5 different beacons that can be used by proximity marketing resellers. Once the deployment location and use-cases are finalized, decide which beacon fits the bill. What should you set as the range and advertising interval? The range of the beacon should be decided based on the use-case. If a beacon is placed outside to promote the business, be sure to set it at its maximum range and a low advertising interval. In-store beacons, when tied to a product, should have the minimum range so that consumers only receive contextual information. You can experiment with the range and advertising interval on the Beaconstac app. As a proximity marketing reseller, you must study the target audience of your client’s business. If the majority of the consumers own an Android phone, then targeting them through Google Nearby should suffice. The same can be achieved on iOS devices as well through NearBee. You will want to take extra measures to incentivize customers to download the app. However, if you offer app development as one of your services and your client wants more functionalities, consider integrating the Beaconstac SDK to their existing app or the one you build. We also encourage building a Progressive Web App(PWA) instead of building a native app as PWAs have been enjoying tremendous success. You may find these resources useful when trying to run an effective proximity marketing campaign. What kind of content is not allowed on Nearby? It may be tempting to just start sending one campaign after the next, bombarding customers with offers but try to refrain from doing so. Instead, try a laddered approach. Send one campaign and link it to the second and so on. This way you can keep your customers hooked and they get to decide which offer to avail of. Say, the business has a blooming Facebook business page or has stellar ratings on Google listings. You can direct customers to a particular URL or an app using App Intent. Beaconstac also allows customers to be retargeted online on Facebook. All that needs to be done is to insert the Facebook Pixel Code in the dashboard. Beaconstac offers an extremely neat feature called ‘Schedule’. This allows campaigns to run automatically for when they are scheduled. Study the peak hours of the business and schedule campaigns accordingly. For instance, if a cafe has a lot of people lining up in the morning, schedule a campaign for the morning vs. late afternoon when there are only a few people around. Apart from peak hours, you can also take the holiday season into consideration and come up with holiday-themed campaigns. Another factor that you may want to take note of is the weather. Subway recently increased its foot traffic by 31% by tailoring advertisements based on the weather. Often, clients can get carried away and expect a high click-through rate (CTR) based on the number of customers who received the notification. CTR is based on a lot of factors and it is highly likely that a large number of people did not find the campaign relevant to them. This is, of course, not set in stone. Read this article ‘How to improve CTR’ to find out what more you can do. Are you a Beaconstac white label reseller? The aforementioned points are also applicable to white label proximity marketing resellers. In addition to this, if you are a white label proximity marketing reseller who does not manage the campaigns for your clients, be sure to include enough information to help your clients start their beacon journey. Interested in becoming a proximity marketing reseller? Check out Beaconstac’s reseller plans that let you manage all your clients with a single login.